Children only act out from a place of stress, anxiety and fear. When a child is hyperactive, easily distracted, lacks focus, is disobedient or enraged, these are signals that he feels unsafe. He may not have had a chance to learn to calm down with the help of his parents, so he is disconnected from his thinking and feeling. If you parent from fear (“I am not a good parent!” or “My child is bad and will always be bad!”) or with fear (“I am deeply afraid my child won’t listen to me so I have to yell and rage to get him to obey.”), your child will be afraid and will act out. If you parent with love, comfort and patience, your child will calm down and will act out much less often. A child acting out in anger is actually afraid. If you parent with fear and anger, you will get more fear and anger from your child. If you parent with love, you will get love from your child. Children must first learn to CO-REGULATE their emotions WITH PARENTS, then they later learn to self-regulate. Self-regulation is the ability to manage one’s physical, emotional, cognitive and behavioral responses to a range of situations. 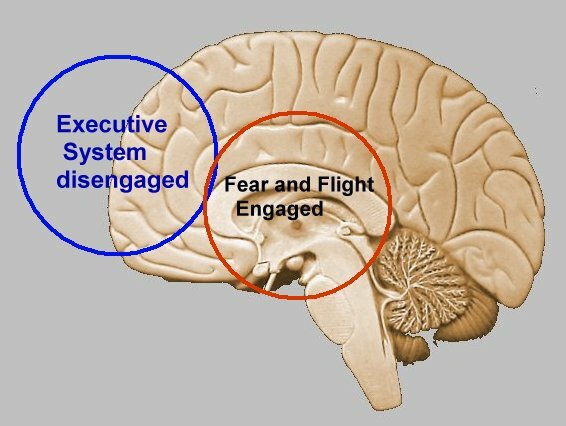 Children diagnosed with ADHD, autism, Asperger’s and sensory disorders have been conditioned to easily be triggered into the “fight-of-flight” fear response, so that they have never properly developed the ability to self-regulate. Self-regulation uses the “thinking” parts of the brain to control the “emotional” parts of the brain. Physical abilities to manage tasks such as movement, sleeping, eating, speech, sensory responses. Executive Functioning/Cognitive abilities such as problem solving, logic, reasoning, thoughtfulness, focus, joint attention, attention shifting (transitions), managing arousal level. Emotional abilities such as registering emotional cues from the body, modulating excitement, controlling “fight-or-flight” urges, reacting to change. Social abilities such as finding pleasure in positive social interactions with peers and adults, understanding social rules and roles, advocating appropriately for self. Controlling physical cues and responses is the foundation to behavioral self-regulation. When in doubt, look to solutions in the physical environment to your child’s behaviors. EXERCISE IS ESSENTIAL! A minimum of 30 minutes daily of rigorous physical exercise, preferably outdoors, is a requirement for kids with ADHD and other behavioral problems. If you do nothing else to help your child, get her some exercise. How much exercise? Kids should be breathing heavily and sweating for 30 minutes. This means constant running, jumping jacks, jumping rope, bike riding, swimming, soccer, skiing and the like. Join with your child to model healthy lifestyles. BEING OUT IN NATURE has been shown through research to have a tremendous calming influence on people. Go for a hike in the woods, garden with your child, sit by a lake, birdwatch or go camping or fishing. Research shows that HEAVY EXERCISE is especially good for kids with ADHD. Try slowly tossing a 5-pound medicine ball with your child. Stand close together and have the child over-emphasize the flexing of the knees, ankles and feet. Other heavy exercise includes having him push or pull a heavy object (a vacuum! ), lift heavy objects (taking out the trash! ), or supervised weightlifting of light weights. Heavy exercise seems to not only burn energy but keep them grounded because they have to regulate their movements and slow down. Try doing heavy exercise before times when the child needs to be calm, such as doing homework. HEAVY OBJECTS: Many children with ADHD and autism feel calmer when they wear a weighted vest, a weighted scarf or place a heavy object in their lap. For a cheap option: Place rice in the knotted sleeves of an old shirt and drape it over the child’s neck. Other types of exercise help increase awareness of others. Lead the child in “follow the leader” games. You can model “Simon Says” activities such as “climb the ladder,” “row the boat,” “hop on one foot” and have the child imitate. Do these actions fairly slowly and deliberately. Make sure the child is watching you and imitating well. Dance or aerobic dance exercises also teach modeling and rhythmic coordination: Try marching in place, skipping, punching across the body, jumping jacks, etc. Or just put on some uptempo music and dance together. CALMING MUSIC: Calming starts with the ears. When we hear prosodic words (warm and melodic intonations), the muscles in the ears relax, then the muscles in the eyes and face. Our breath deepens, the heart calms, the sympathetic defense system down-regulates. Try music with soft, slow rhythms. Example: “Sacred Earth Drums,” by David and Steve Gordon, Sequoia Records. RHYTHM AND TIMING: Kids with ADHD and other behavioral problems may lack the ability to sense time and rhythm correctly. This can lead to failure of executive functioning, sensory problems, poor motor planning, decreased emotional regulation and learning disabilities. Consider music lessons, especially drumming. Some kids even calm down when doing homework with the use of a metronome. (Free apps are available for phones.) Or just put on the metronome and have the kids clap or march to the beat and try to match the beat exactly. Playing patty cake or bouncing a ball back and forth are also simple ways to teach rhythm skills. “DE-CLUTTER” THE SENSORY ENVIRONMENT. Kids with hyper-vigilance to threat are often hyper-sensitive to sensory input, such as noise, sights, touch, taste, smells, pain, social interaction. Parents can reduce the noise at home by turning off electronics. Reduce the clutter in the home to reduce visual stress. In social situations, such as church or school assemblies, arrive early so that your child can gradually adapt to more and more noise and people. Consider a white noise machine or a fan in the bedroom at night. MASSAGE CALMS. Before bedtime, before stressful events or to calm a tantrum, have your child lie down and give him a slow, deep pressure massage. YOGA AND MINDFULNESS MEDITATION: These are research-proven to reduce anxiety and calm the body and mind. Imaginazium.com has child yoga cards and I-pad apps. Meditation, especially done as a family, can teach long-term self-regulation skills and calm a child instantly. Meditation can reduce anxiety, depression, and stress. One study found it could improve attention by 30% in 12 weeks. Go to www.marc.ucla.edu to listen to FREE guided meditation sessions. AVOID ELECTRONICS 90 minutes before bedtime. Research shows the blue light emitted by computers, TVs and other gadgets resets the body’s sleep “timer” so kids don’t fall asleep well. Plus the fast-paced nature of TV programs and video games amps up the mind and body. SLEEP STARTERS: For kids who struggle to sleep, try warm baths, warm milk, and melatonin (a natural body chemical that regulates sleep/wake cycles). Calm the household down in the hour before bedtime — avoid things like loud music or TV, rushing around or loud voices. Avoid the use of non-natural detergents on bedding, especially those with strong chemical perfumes and scents. If you can, buy all-natural mattresses and pillows (wool, down/feather or cotton), not plastic or foam. Keep lights low 90 minutes before bed to trigger the body to slow down and move toward sleep. NUTRITION: Check with your primary care physician first, but some children benefit from adding alpha-omega 3 (fish oil), flaxseed, or walnuts. Eat protein for breakfast; this reduces hypoglycemia or low blood sugar. Children often become jittery from hypoglycemia if they eat a sugary, carbo-loaded breakfast of foods like cereal, toast, donuts, granola bars, and yogurt. Protein-loaded meat and eggs also contain tryptophans, an amino acid that is calming. The brain is set up so that when the “fight-or-flight” mode gets switched on, survival is the main focus. Learning, storing memories, processing emotions (other than fear), and caring about other people are all lower in importance. When the nervous system feels safe, people have the ability to be more creative and learn. So it makes sense that when a person is in a chronic fearful or stressful state, he is less likely to be able to learn. This is why children with “ADHD” and other emotional and behavioral problems have difficulty learning. Their brains are focused on surviving, not relaxed and in a learning mode. The first way to improve learning and memory formation is to make sure the child is relaxed, calm and not in “fight-or-flight” reactivity. Every time you TELL a child what to do, he loses an opportunity to learn for himself what to do. This ability is at the core of self-regulation. Rather than telling your child what to do, ASK: “What is wrong with what you are doing?” “Why is hitting your sister wrong?”, “What should you do next?”, “What is a good solution?,” “How do you tie your shoes?,” etc. This engages problem-solving cognitive capabilities. Children have to get out of their emotional brain and into their thinking brain, which is good practice for self-regulation. Plus, being told what to do can feel like criticism to a hyper-vigilant child and may trigger the fight-or-flight response. Children with anxiety-related disorders don’t feel emotionally or socially safe for some reason, so the first tip for parents is to look HONESTLY at everything you and your family are doing that may be increasing your child’s sense of emotional or social fear. Are you shaming, blaming, criticizing, yelling, threatening, spanking, hitting, or withholding love to get appropriate behavior? These parenting tactics can all increase a child’s sense of fear, usually centered on a fear of rejection or abandonment. Preventing a child’s sense of fear is the best way to reduce or eliminate ADHD and other anxiety-related disorders. Use “reflective listening” (See handout) to help your child express, identify, experience and manage emotions. Learn to express and label your emotions to model this practice. Instead of focusing on correcting a child’s BEHAVIORS focus on attuning or connecting to a child’s EMOTIONS. A child who knows you care about her will behave in ways that bring more feelings of love her way by behaving appropriately and pleasing you. A child who believes you don’t care will behave in oppositional and disrespectful ways. Do everything you can to increase your child’s social functioning. Ensure he gets plenty of peer play time in an unstructured environment. This is how kids learn to manage the disappointments and conflicts that naturally occur in human relationships and how they will learn appropriate social skills. If they don’t self-regulate with their friends, they will soon learn that this is not well received. If arguments ensue between siblings and peers, don’t automatically jump in and solve it. Allow the children to solve it themselves, unless the situation is escalating toward physical danger. food allergies or intolerances (dairy, gluten/wheat, artificial sweeteners and colors, high fructose corn syrup, sugar) Up to 65 percent of children according to a Harvard Medical School study are lactase deficient, which causes intestinal inflammation and pain when eating dairy. Try adding probiotic supplements for a few weeks to see if this replaces the lactase enzyme that is deficient. Kids who have constant intestinal pain may not know how to explain it, but may just act out. Check with your primary care physician on these issues or ask for a referral to a specialist. Consider VERY CAREFULLY before giving or continuing your child on ADHD medications.